Business Owner Sets Minimum Wage for Employees. Limbaugh Calls That Socialism. I Call Him Ignorant. "They were walking me through the math of making 40 grand a year," he said, then describing a surprise rent increase or nagging credit card debt. "I hear that every single week," he added. "That just eats at me inside." This is pure, unadulterated socialism, which has never worked. That's why I hope this company is a case study in MBA programs on how socialism does not work, because it's gonna fail. Now, Rush, let me talk to you the way I'd talk to someone who knows absolutely nothing about the differences between capitalism and socialism, since that clearly describes you. When a business owner decides on a wage policy for his employees, that is something that only happens in capitalism. In socialism, the government doesn't just set a minimum wage; it determines all wages. And he's gonna find out it isn't gonna take long, because once everybody figures out they're all making the same, no matter what they do, the slackers are gonna surface. Human nature. Um, Rush, where did it say that Mr. Price is going to pay all his employees the same wage "no matter what they do"? Having a minimum wage isn't the same as having a permanent, single wage. And where did he say that if employees aren't doing their jobs, if they became "slackers," they'd stay employed forever? Er, nowhere. But you've gotta just make stuff up to undercut this guy, a boss who is doing the right thing and poses a threat to your elitist ideology. And your audience won't call you out or fact-check you, so why not? 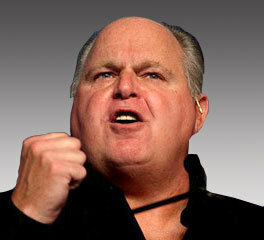 This is just another incident that exposes Rush Limbaugh for what he is: Someone who believes that employees deserve nothing but the contempt of their bosses, someone who believes that severe economic inequality is not only unavoidable but a good thing, and someone who has no regard for the truth. Three strikes. You're out.